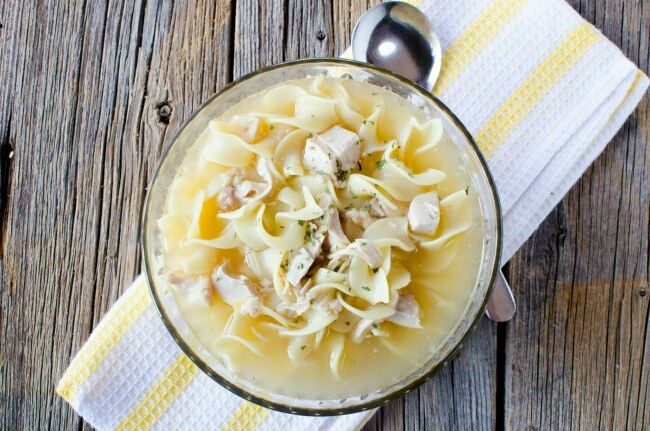 If you are looking for a really simple, yet delicious chicken noodle soup recipe, this has been my go to recipe for years now. 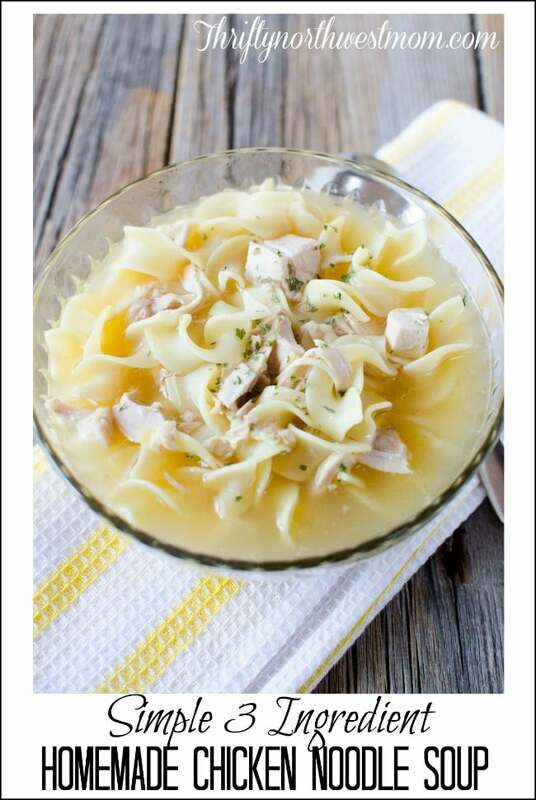 Make this 3 Ingredient Chicken Noodle Soup (not including water and salt and pepper), using a whole chicken or chicken breasts (or you can even use rotisserie chicken meat from the store). My favorite way to make it is to start with a whole chicken, and then use the water that I boiled the chicken in for the broth base. It is great in the winter, or when your not feeling well, and its very simple to make. My kids won’t touch canned chicken noodle soup any longer, they love this one too much. I have used this three ingredient basic recipe for years. Most of the time, we use just these ingredients. Sometimes we will branch out and add in diced onions or carrots or celery or peas too, if you like any of those things. You could add corn or potatoes too, its really up to you. We love ours simple, and full of chicken though, so we generally stick to the basics with this one. Its a comfort food in my home. Start by boiling your whole chicken until its cooked through and de-boning your chicken (reserve the water you boiled the chicken in for the base of your broth). You could also start with a rotisserie chicken or use boneless skinless chicken breasts in this step too. I prefer to boil the whole carcass for the health benefits, and its just a richer broth. Once you have your chicken ready, use the water you boiled your chicken in (add to it with regular water if there is not enough left) and then add in the chicken bouillon to make a hearty broth. Salt and pepper to taste as well. 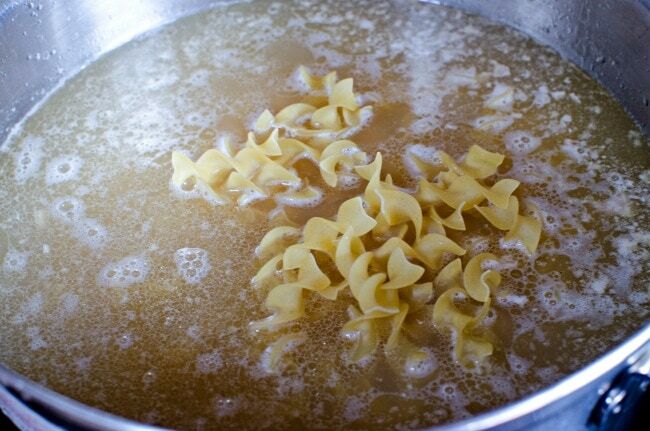 Once you have your broth ready you can add in the chicken you have shredded or chopped, and the egg noodles. 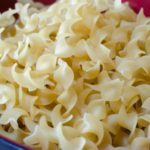 Cook until the egg noodles are soft, and its ready to serve. Start by boiling your whole chicken until its cooked through and de-boning your chicken (reserve the water you boiled the chicken in for the base of your broth). You could also start with a rotisserie chicken or use boneless skinless chicken breasts in this step too. I prefer to boil the whole carcass for the health benefits, and its just a richer broth.Start by deboning the chicken off the rotisserie chicken, and setting that aside. 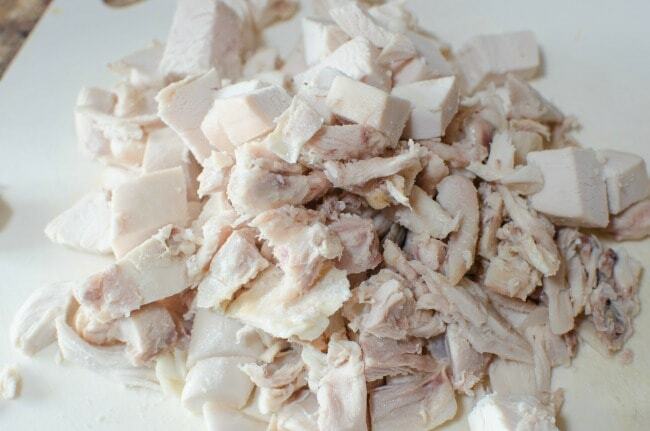 In a dutch oven or crock pot add the water, and the chicken carcass, skin and fat that is left over after you have deboned it). Bring water to a slow simmer, and simmer for approx. 30 minutes. Remove carcass, and strain broth, and add back to your pot. Add in approx. 6 tsp of chicken bouillon (or per instructions on your bouillon), You can add more water if too much of the water boiled out while simmering. Add in the chicken (roughly chopped or broken into bite size pieces) and the noodles. Salt and pepper to taste, and simmer until noodles are tender and ready to serve. 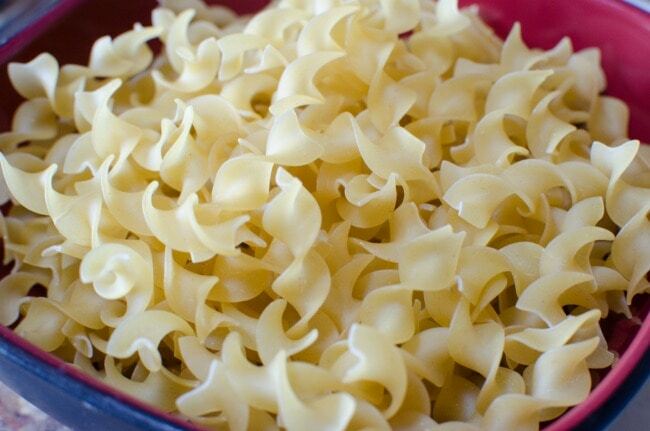 If you opt to add carrots, onions and celery, add these before the noodles. Add the noodles once the vegetables are tender.